Sometimes it feels like everyone's eyes are on you. CTV cameras, hackers, on-line scrapers, cookies, are watching and tracking us and regulators are telling us what we need to do to meet compliance requirements. Even facial recognition software at shopping malls are watching you – and sending you targeted specials to your phone as you walk by the stores in the mall! We can’t expect that everyone who has collected our information, like the shopping malls, will protect your personal information. We should each be aware of and concerned about how our personal information is collected, used, and disclosed with – and without – our knowledge and consent. I think that we should practice privacy like no one is watching. We each need to build privacy into everything that we do in our personal life and our business because it makes sense to us to do that—not because someone says that you should. The internet can instantly connect us to webpages that answer our questions and promise stuff to fulfill our dreams. But now, the internet is also connecting to physical things. These things provide a service or convenience that we want. For example, an app on your smart phone will start to warm up your car on a winter day so that you don't have to scrape the windows. But, if someone hacks your internet enabled phone and remotely controls your car while you are driving, well, that's an example of how internet connected things can now physically harm you. Listen to more examples with Bruce Schneier's interview on CBC podcast, SPARK, talking about his book ‘Click Here to Kill Everybody'. So, lets take control of our privacy by making sure that we have some solid privacy practices that we can follow every day. And prevent internet connected things from harming us and hackers, and other folks to collect our information without our consent. Protect you identity. It isn't about keeping secrets. It is about protecting what makes you, you. I created this Practical Privacy Tips infographic to share with the librarians and tech folks attending The Alberta Library Netspeed conference this month. I shared my practical obsession with privacy and confidentiality during my keynote ‘Privacy Like No One Is Watching'. By clicking on the image below, you will download your infographic that you can print. Post it in your place of work to remind you to take control by using practical privacy tips. This couldn't be more true than when your computer crashes. It's a terrible feeling when your software or hardware suddenly doesn't work, or you can't find an important file you know you had last month. This experience can be a speed bump on your busy day, or a nightmare that takes you days and weeks, and a lot of money, to recover. Your encrypted backup files need a ‘key' or algorithm to de-encrypt the files so that you can read and access the information. Have you kept a copy of the encryption key in the same place as your source documents? Or have you kept the key in a separate location – away from the source documents and away from the backup files? Have you recorded in your disaster plan how to retrieve the key? Cybersecurity is for all businesses – even if you are not using social medial or have a website! 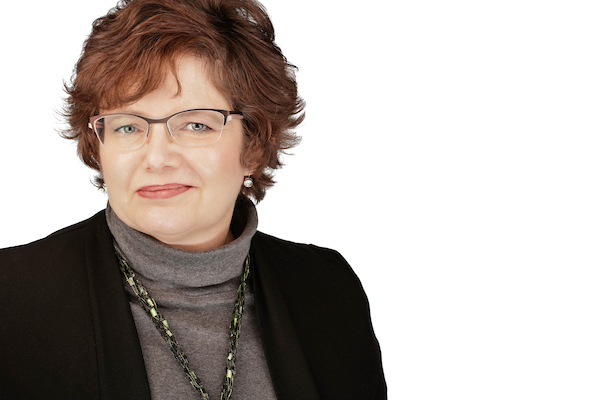 Many small business think that they are too small to be attacked – not true! Not reviewing your security practices and keeping up to date can leave your small business vulnerable to attacks. Remember to change your clocks for daylight savings time – and get into the habit to review your backup. Check to make sure that it includes all the information that it should and that you can restore the backup to a clean machine. What will you do to improve your computer backup plan? October is CyberSecurity Privacy Awareness Month! Information Managers is celebrating by hosting our annual 15 Day Privacy Challenge. The 15 Day Privacy Challenge is a fun, no cost educational opportunity on privacy and security. Take a quick look at your email address book: how many Jennifers and Toms do you see? Even uncommon names can show up more than once, and it’s easy to send an email to the wrong person by mistake. Mistakes happen. But from a privacy perspective, it’s important that our email recipients know what we want them to do should we make an error of this sort. So it’s vital to include some guidelines in the form of a confidentiality notice. Encourage the recipient to inform you should an error occur. Thank them for letting you know about any mistakes. State that you believe their privacy is important, and that you will take every step necessary to correct the error to prevent it from happening again. Does your email signature block and fax cover sheet include these points? We are proud to be a Champion of National Cyber Security Awareness Month #CyberAware. Do Your Club Volunteers Protect Your Privacy? Your family is busy! Kids have sports teams, social clubs, and classes. Parents are involved in clubs and networking too–and, sometimes, you are the volunteer manager and snack co-ordinator, too. But – do your club volunteers know how to protect your privacy? Maybe more sensitive information like dates of birth, street address? 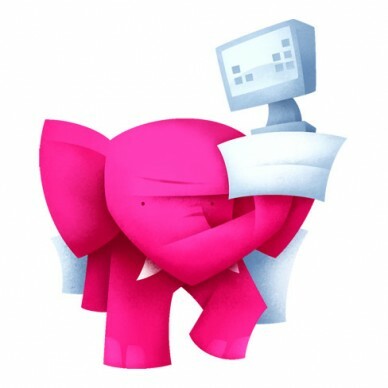 Do you have a policy to mask email addresses to members? Who has a control of the club's financial information? Do you have written policies and training for your volunteers to protect this information? If your club is like thousands of others, you don't have good practices in place to protect your valuable personal information. It only takes a little time and effort now to dramatically reduce the likelihood of a privacy breach in the future. Discover the 3 simple practical tips every club can use to prevent a privacy breach. This works for every type of club – toastmasters, Scouts, soccer team or book club! Join the live webinar to discover the 3 simple practical steps every club needs to improve your club's procedures and prevent complaints, fines, and even jail time! Practical tips that you can use right away to protect your privacy! 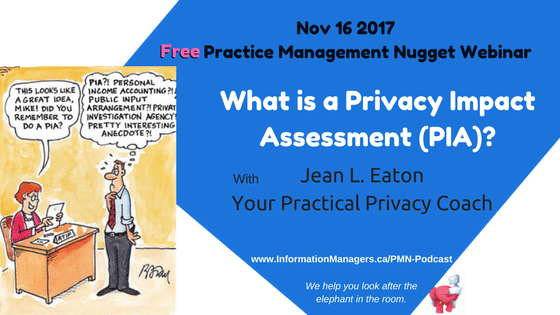 with Jean L. Eaton, Your Practical Privacy Coach! Replay is available for a limited time! This webinar is a special presentation in the 15 Day Privacy Challenge E-Course. Your FREE webinar registration also includes access to the FREE 15 Day Privacy Challenge. Webinar replay will be available in your E-course but join us live – because that's the only way that you get the Q&A! Please provide your email address below and you will be re-directed to the Privacy Challenge registration page. Check your email in-box to confirm your registration! When you register for the webinar, you will also receive the 15 Day Privacy Challenge. This is a fun, FREE online educational opportunity on privacy and security that you can use at home or at work. Enjoy the benefits of the internet without the fear of cyber attacks and privacy breaches when you use these practical tips, tools, and resources. This free online course is ideal for businesses, healthcare practices, or clubs and their privacy officers, employees, and their families. 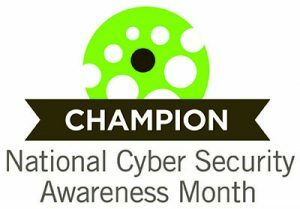 We are official champions of the National Cyber Security Awareness Month (NCSAM). October is Cyber Security Awareness Month and Information Managers is celebrating by hosting our annual 15 Day Privacy Challenge. Paul clicked on a link in an email that encrypted all his data on his computer and now he has to pay a ransom to get the data back. Mary used her work email address to register for the course, “Ready to leave your job?” Now her boss thinks that she is looking for a new job. Alice did not follow your clinic policies and procedures properly and she left a confidential message with the wrong patient. Bob is a new employee and will start his orientation tomorrow. They each use the internet for their personal lives and as an employee. You need to know the best practices on the internet and how to protect your personal information. It's easy once you know how! The 15 Day Privacy Challenge is a fun, FREE online educational opportunity on privacy and security that you can use at home or at work. Enjoy the benefits of the internet without the fear of cyber attacks and privacy breaches when you use these practical tips, tools, and resources. The course is free – there is no risk to you and you will see that the 15 Day Privacy Challenge is the perfect way to make small changes easily that can improve the privacy and security of your information right away! The 15 Day Privacy Challenge starts October 15th, for fifteen days. The challenge includes tasks centered on a privacy or security best practice. Each challenge includes a short description about why this practice is important, how to get started, and links to additional resources. Each challenge will take approximately 15 minutes to complete. All activities are online and accessible from any internet enabled device. Businesses and healthcare providers are legally responsible to ensure that every employee, contractor, and vendor receives privacy and security training, including cyber awareness. Prevent malicious errors, omissions or attacks that could result in fines and even jail time for the business, healthcare provider, employee, or vendor by being up to date on privacy and security best practices. Training is the cornerstone of every privacy and security program. People love games, challenges, and cyber competitions to create variety and interest in privacy and security best practices. The 15 Day Privacy Challenge uses a variety of multi-media content that everyone in your practice can understand. Privacy awareness training alone won’t guarantee that mistakes or errors in judgement won’t happen, but Privacy Awareness Training is your logical first step. The 15 Day Privacy Challenge includes easy to access on-line resources delivered each day. You will have access to all of the resources for one year on the website. BONUS – access to discussion group with other participants to share your tips. At the end of the challenge, you will receive a printable certificate of completion. Successful challengers might also find that this qualifies for CPE credits, too! You will also have many more tools to add to your privacy tool box! You can do this yourself or make it a team event. The finished tasks and poster will contribute to your business' Privacy Management Program. Proudly display your poster to your co-workers and customers to show the steps you have taken to manage privacy and security. Register right away while this is fresh in your mind! You won’t want to miss a single one! Yes, I'm ready to take the Privacy Challenge! Includes the webinar on October 19 – Do Your Club Volunteers Protect Your Privacy? Can You Predict Successful Privacy Awareness Compliance Training? Protect your organization and your patients. Investing in privacy awareness compliance training that is engaging, practical, and easy to access will prevent a privacy breach in your healthcare practice. But, how do you find the right training? Look for a strong completion rate. A high completion rate is the single best predictor of successful privacy awareness compliance training. Most on-line courses have a 6-15% completion rate. 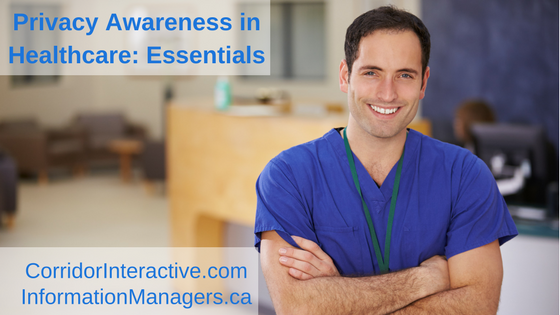 The Privacy Awareness in Healthcare: Essentials program from Corridor Interactive has a completion rate of 95%. And the investment is only $25 per person. Give your patients the gift of privacy. 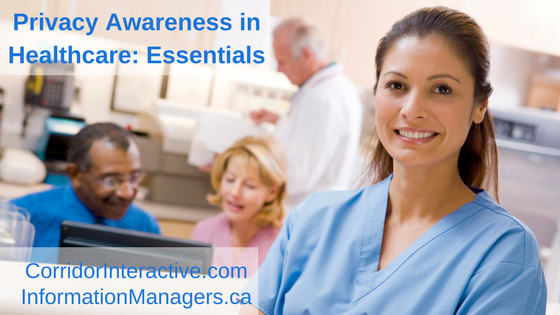 Improve your healthcare practice with privacy awareness education. HURRY! A privacy breach can happen at any time! Cyberextortion – Is Your Patient’s Health Information Protected? Alice had a few minutes before the clinic opened and the first patients arrived. She logged onto the computer and then her personal email through a webmail connection. She checked through her messages and opened an email from a supplier. She followed a link to a website looking for a deal on office supplies and was shocked to find pornographic images! Alice closed the browser and closed her email. Alice could not access any of the files on the computer, not even the clinic's electronic medical record (EMR). Is data the new hostage? A healthcare business has many types of data on the computer network – patient health information, employee personnel records, fee for service billing, accounting and tax information. That information is important to you – and makes it a valuable target for cybercriminals. Here's what you should be doing now to prevent cyberextortion on your computer network. Know where all your data is kept – your active patient records, archived patient records, billing records, etc. Remember to reclaim data that you may have left behind with previous vendors – transcriptionist, billing agents, remote data, retired EMR vendors, etc. Collect only the information that you need; not information that might be nice to know or that you might have a use for in the future. Install or update endpoint security solutions anti-malware and anti-virus software. Backup your data with secure encryption. Make sure that you have the encryption key and that you know how to use it. Test restore the backup and test the encryption key, too. Keep your backup separate from your computer network. You might store your backup on encrypted external drives or remote backup. But don't keep your backup device connected to your computer. If you are attacked by ransomware, the backup device can be locked. too. Is your current back-up device secure? Your backup should be maintained in an area with appropriate physical safeguards – for example, in a locked, secure, filing drawer, safe or data centre in a location separate from the computer network. Learn how to recognize phishing attacks so that you can prevent cyber attacks, too. Risk can be mitigated through use of appropriate safeguards that will lessen the likelihood or consequences of the risk. Layers of safeguards – administrative, technical, physical – will help to prevent privacy and security breaches. When both the likelihood of the risk and the risk of harm is high, the more layers of safeguards should be considered to mitigate the risk. The Office of the Information and Privacy Commissioner (OIPC) of Alberta has released an ‘Advisory for Ransomware'. You can learn more about preventative measures and ransomware response here. 10 Fundamental Cybersecurity Lessons for Beginners, by Jonathan Crowe, Nov 11 2015 to help you get started on improving your security. See getcybersafe.ca for more information on common internet threats and on how cyber attacks affect businesses.